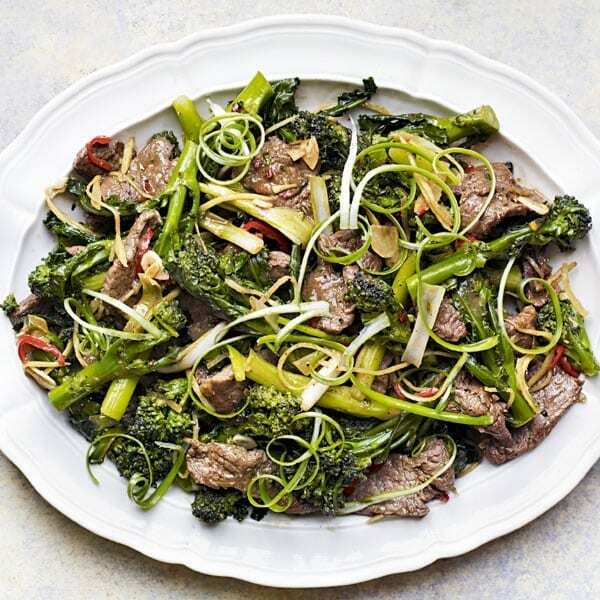 A wonderful alternative to a Chinese takeaway, this sticky ginger beef and sprouting broccoli stir-fry recipe uses classic Asian flavours with British produce. Steam the sprouting broccoli spears for 3-6 minutes or until just tender, then remove and set aside. Trim away the fat from the sirloin steaks and cut the meat across the grain into long, very thin strips. Mix the soy sauce, stem ginger syrup, five-spice powder, cornflour, salt and black pepper in a medium-size bowl. Stir in the beef and set aside. Mix the hoisin sauce, sambal oelek, wine vinegar and shredded stem ginger in a small bowl. Set aside. Trim the spring onions, then separate the green part from the white. Cut the white part lengthways in half, then across into two. Shred the green parts lengthways, then set them aside in a bowl of cold water to make them curl. Heat a wok or large deep frying pan until hot, then add the sunflower oil and swirl it around to coat the sides. Add the chilli, garlic and shredded fresh ginger and stir-fry for 15 seconds. Add the beef and stir-fry over as high a heat as you can for 1-2 minutes until it is only just cooked and no longer pink. Add the shaoxing wine and stir-fry for 15 seconds more, then add the hoisin sauce mixture and toss together well. Add the sprouting broccoli and the white part of the spring onions and stir-fry for a minute until heated through. Sprinkle over the sesame oil and spoon onto a warmed serving plate. Lift the curled spring onions out of the water, dry briefly on kitchen paper and sprinkle over the top. Serve with steamed rice. Shaoxing (also spelt shaohsing) wine is a dry rice wine from eastern China, available in Chinese markets and in the world food section of large supermarkets. It’s worth buying a good quality one because it really enhances the flavour of the dish it’s added to – but if you can’t find it you can use a dry fino or amontillado sherry.